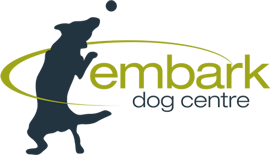 Established in 2009, Embark Dog Centre redefines canine care by challenging the traditional ‘babysitting’ methods employed by many companies. They utilize beneficial approaches to the body and mind, bringing added value and an intelligent solution to both consumers and canines. Embark wanted to launch their new business in a way that set them apart from the masses and they approached Sparktank to help them develop their brand and their marketing materials. To do this, we needed to get their image polished from the get-go, displaying the professionalism, integrity and unique qualities of their business. 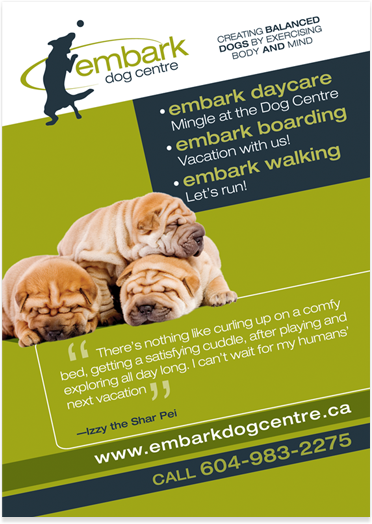 In order to establish Embark Dog Centre as a brand that would succeed, an innovative brand and logo needed creating. This had to be something that distinguished the company and the different services they offered while appealing to their targeted audience. We went through a number of concepts before we got it right, adapting and changing the logo until we devised something that showed movement, was clean and captured the core values of their company. People get mail all the time that advertises one service or another so we needed to create print material that Embark Dog Centre’s targeted customer would look at and engage with. We achieved this by creating a quirky, fun brochure that featured testimonials – from the dogs themselves! We also created a series of advertisements for local publications that helped generate more business. 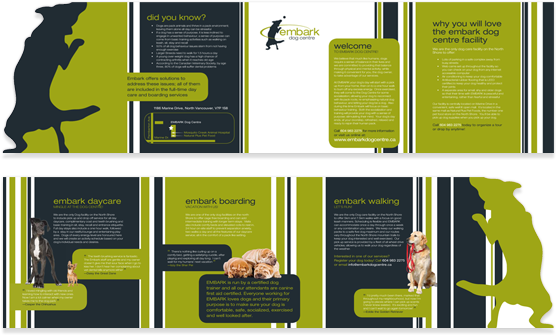 Alongside the brochures, we knew that Embark Dog Centre needed to be presented to the community in different ways. With a budget to adhere to, it needed to be low-cost but highly effective, while also incorporating the unique qualities that this company embodied. We made full wraps for their vehicles, creating driving billboards that would be seen wherever their employees went. This resulted in many calls from new customers who had seen them advertised on these vehicles. Why? Because it stood out from the crowd. 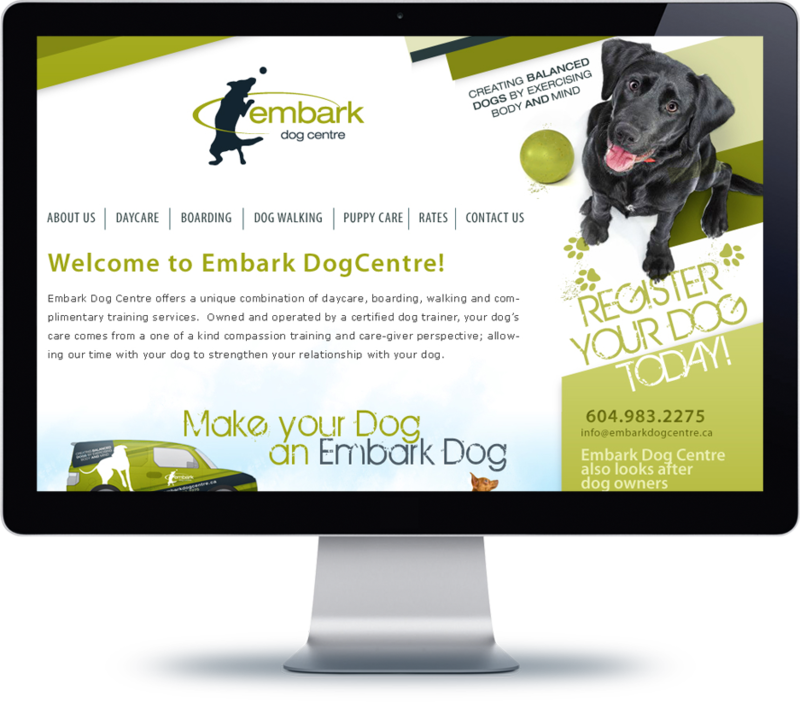 Customers needed to be able to gather information about Embark Dog Centre online, which meant their website needed to showcase all of the programs available. It also needed to incorporate Search Engine Optimization (SEO) techniques that would enhance their franchise marketing strategy and bring them new business. A fully-interactive website was created with an easy-to-use platform that allowed customers to research and educate themselves on what was available. We teamed this alongside various SEO techniques; including local SEO strategies to ensure high visibility and top search engine rankings. Grand Opening is a huge success. New location fills up quickly with a waiting list of eager customers. Embark's professional marketing attracts interest from new franchisees. Thank you for building us a brand that we are very proud of. You and your team have done an excellent job!